In this SEO guide series, you will learn everything you need to know about SEO. As you know from reading our previous blogs, “3 Take-Off Strategies For Your Real Estate Investor Website” and “5 Tips For Building A Wholesale Buyers List Fast”, SEO (or search engine optimization), is an essential part of having and maintaining a successful real estate investor website. But we’ve haven’t talked in depth about what it is that makes SEO so important. In this first installment of our SEO guide, we will be discussing all you need to know about keywords. 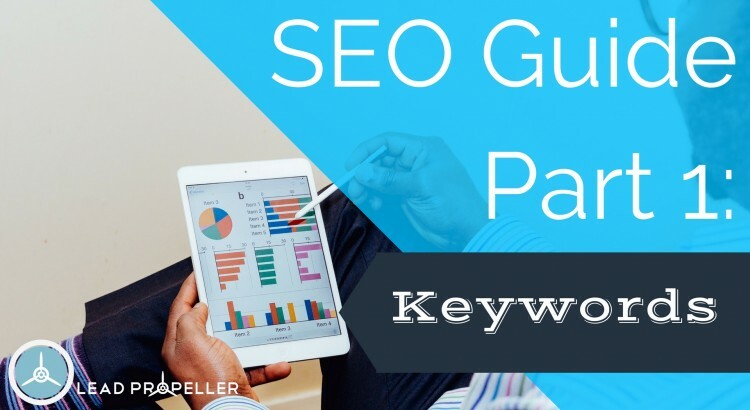 By the end of this SEO guide part 1, you will be an expert in all things keywords: what they are, how they work, why they’re important, and most of all how you can use them to make your content rank higher in searches. In simpler terms, a keyword or keyphrase is the exact words people type into a Google search. Think about the things you search for in Google. Having this mentality is key to knowing what your audience will be searching for. Keywords within posts are what Google uses to determine how searchable your content is. The more dense your keyword is in a blog post on your website, the more likely you are to show up higher in relevant searches. To better optimize your posts, you’re going to want your keyword, or related keywords, to show up within the first 100 words, as well as in your header and subheader. In HTML, an H1 title is the main header of the blog or article, whereas an H2 title is a subheader within the post. Take this blog as an example: our keyword for this is “SEO Guide”. You can find our keyword in our H1 title that reads “SEO Guide Part 1:…” and in various related phrases throughout our H2 titles such as “How They Work For SEO”. You want your keyword to show up throughout your posts because this is how Google will determine how relevant your post is in regards to what is being searched. Let’s say that a potential customer is searching for “how to sell my house fast” and your real estate investor website has a post with the keyword “sell my house fast”. Because your keyword matches the searched phrase, you will be more likely to show up in that person’s search results. Remember, you want your content to be relevant and useful. If Google doesn’t find your content relevant to a search, or useful to the searcher, then your posts and website will not appear high in search results. One way to make your content relevant and appear high in search results is to use your keyword throughout a post, also known as keyword density. Your keyword should also be saturated in your post, but not stuffed. Keyword stuffing is when your keyword appears too frequently and in non-organic places. A way to help avoid keyword stuffing is by reading your post out loud to yourself, if you notice a particular phrase showing up an unnatural amount of times, then you’ve probably stuffed your keyword too much. Generally, the safe percentage for keyword density is between 2% – 5%, with your related terms hovering around 7%. Any more than that and it might come off as keyword stuffing, which we already know is bad for your website! One of the tools we have found very useful when checking our keyword density is WordCounter.net. When entering your post into WordCounter, you will get results of what your top keywords are and the density of those words. This is great for helping your post stay within the “safe zone” of keyword density so as not to appear like you’re stuffing your keywords everywhere. Doing research for the most effective keywords to use can be time consuming, but will ultimately pay off. It is important to research what keywords to use before making content so that your posts will go live already knowing that they will be searched for. The biggest mistake you can make is by assuming you know what keywords will work. Always, always, always research. Some of the best keyword research tools are Moz Pro Keyword Explorer, and Google AdWords: Keyword Planner. Using both of these tools will help you to find keywords that are highly searched, helping you to determine what keywords you should put in the posts on your website. While this is all entirely doable on your end, it can be a bit time consuming. Researching keywords and producing content can take time away from your actual business: real estate investing. This is where managed online service providers can be a huge lifesaver. Take LeadPropeller for example. With the new SEO pack from LeadPropeller, you will have custom content already made for you. And the best part is, that content is already search engine optimized with keywords and phrases built right in. The cherry on top is you don’t even have to do any work, LeadPropeller takes care of all that for you. A good example of a keyword for real estate investors to use is “sell house fast”. This keyword is applicable to the specific real estate problems of your potential customers, but also general enough to encompass other aspects of real estate investment for related searches. Your keywords should also tie back to your local area, or area of business. DannyBuysHouses.com, a successful real estate investor in the San Antonio area, is a great example of using your location in keywords. In fact, the very first thing you see when visiting that site is a title reading “We Buy Houses in San Antonio and Surrounding Areas”. That keyword is perfect! It not only includes the location, but the phrase “we buy houses in…” is one of the phrases your potential clientele will be searching. Remember, you always want to make yourself as searchable to your potential customers as possible. You might think that a keyword such as “wholesaling house for sale” might be a good keyword, but the average person doesn’t regularly search for the word “wholesale”. Instead, make the keyword “house for sale in [target city]”. The second keyword example will be much more successful than the first one. Don’t Have The Time For SEO? Having a sense of what keywords are going to work for your local area is great, but as your site starts to gain traction you may find that some keywords work better than others. To make your website as optimized as possible, you need to use the best keywords for your area. That’s where LeadPropeller’s years of experience can help you. We’ll put in the time to identify which keywords are just right for you using our done-for-you SEO services so that you don’t have to be a keyword expert.